Broad, bell-shaped, light to mid-blue spring flowers and mid-green leaves. This early spring flowering clematis is perfect for covering a north or east facing wall. The fluffy seed-heads, an important decorative feature, look fabulous glistening in the sun. This clematis really took off in the first year and plenty of flowers. Planted through a white shrub and looked fabulous. A lovely and unusual addition to a set of climbers that went in last year. Very happy with this one. A brilliant plant for a shady or north facing site, where it grows vigorously. Flowers are beautiful and good for bees. Foliage is attractive & good for covering an exposed wall. 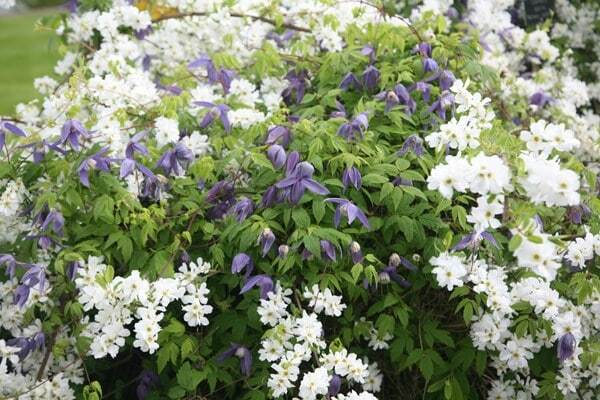 I planted this climber next to a gorgeous Viburnam maresii, the intention is the both flower together, the blue of the clematis and the white blossom of the clematis. This worked out this year but will become even better as the clematis becomes more established. I would buy this clematis again if I had space. Climbing and spreading well, and expecting numerous flowers. Has grown well over season and appears to be springing into life again now, if spring ever arrives I look forward to it flowering! I might this product again, but sadly it was eaten and died! Don't know why this happened as a clematis nearby was fine. Protected it with wire netting but it still happened. This was the last part of a Christmas voucher and I bought it because my late husband Frank loved clematis.I was so pleased with the healthy looking specimen that arrived recently, Good amount of healthy leaves and buds which I am sure will romp away in a border facing my kitchen window. It's so good being able to receive plants from Crocus, no "poorly" or neglected ones ever arrive so one can shop with confidence that what one buys will give years of pleasure. Bought this climber to grow trellis. Condition is fantastic. Colour will look superb amongst others I have purchased and been very impressed with. Could not find a fault with this plant as with the others I purchased. I will definitely buy again from çrocus again with absolute confidence. Bought this to grow up trellis along with other climbers. This came in fantastic condition and is looking very healthy.very impressed with this purchase. Can this clematis be grown in a large patio tub. I need it to cover a screen on a north facing wall. If not can you suggest any clematis or honeysuckle that could do it.